The science of reading the electrical activity in the cerebral cortex is called encephalography; the material representation of the different electrical folds of the brain an encephalogram. A biosignal like no other, the EEG is used to specify electrical properties and map functional organization. The graphic rhythms became widely recognized as a stand-in for life itself, or at the very least, for that which differentiated life from death. In the development of EEG techniques and instrumentation there has been a poetic license to hallucinate, an appeal to that which is not true in the service of the truth—a Barnum-esque gesture, the refinement of morals through deception. Humbug and a dash of magic dust. How might one see the truth of EEG, or more precisely, the truth of its discursive regime? It began, in earnest, with dying soldiers and dogs. The presence of pattern emerged from the brains of Prussian soldiers and the animal surround of Europe. After much poking, prodding, and drilling a sensual connection was made between unreachable, invisible activity in the brain and us, on the outside looking in. A binary was secured between surface and depth, our desire matching our discovery. Here was an origin of our neuro-now. Muscles on one side moved when the brain on the other side was stimulated. The brain, itself, was electric after all! This momentous verification was the key to securing the scalp boundary and overcoming it. A set-up to the heroic narrative. Story upon story after story, articles, books and public policies. A city of words and deeds, ever drawing upon earlier stories about the fluidity of consciousness, the internal dialogue of mental faculties, the mind’s connection to other worlds. With the application of current-measuring devices in the late nineteenth century, the brain’s subjection to the human industry of schemes and dreams was all but complete. By the time this communiqué that you are reading was posted, electricity had long become accepted as a medium of psychic life. Yet what of its source? The consensus pointed to the interactions between cortex and thalamus as well as neuronal networks in the cortex. These networks were thought to possess an inherent capacity for rhythmicity—their electrical output, a combinatory splay, perhaps, of neurons, action potentials, post-synaptic potentials, and chronic neural depolarization. But whatever the signals’ source, it was certain that they had to be amplified 1,000,000 times in order to be displayed on paper or a computer screen. And it is the amplification that is more than more of the same. For it is only a slight exaggeration to say that electrical currents—the object of electricity as well as the metaphors and explanations, the gestations and the grammar—have become amplified to the point of becoming commonsensical. They have zipped and zapped around to such a degree as to have become a priori, that is, infinitely rechargeable. The following questions currently abound: is religion an evolutionary adaptation—a “behavioral sequence” made “attention-grabbing, intuitively appropriate, and compelling” by “specific aspects of human cognitive architecture”? Does religion generate or is it activated by the “hazard-precaution system” which, when malfunctioning, gives rise to all manner of obsessive-compulsive disorders? Is religion part of the executive function where the self reflects upon itself for purposes of renewal and greater control? Does religion stimulate a “relaxation response” or provide emotional strength? Does it provide therapeutic value? Or does it prevent persons from owning up to their cosmic solitude? Such inquiries into the religious not only speak to the discursive construction of religion but also have a character that aligns quite well with the religiosity under scrutiny. For in figuring out the brain, really figuring it out, you inevitably begin to make sense of yourself figuring out the brain. And figuring out something like “religion or spirituality (R/S)” is a culmination of sorts, the displacement of one God for another. A version of Enlightenment culminates in a posthuman superself ever within your grasp. Born in Kansas City and educated at Cambridge University, Walter was an integral figure in turning laboratory techniques for detecting the electrical activity of the brain into a practical and commercially viable enterprise. Walter’s work was part of a broader scientific practice in which all manner of extreme experiences were induced and measured in the name of defining the normal. Encephalographers used sensory deprivation, overload, and drugs. Tons of drugs: diethyl ether, cyclopropane, barbiturates, nitrous oxide, chloroform, ethylene, flouromar, halothane, epinephrine, benzadrine, caffeine, sodium nitrate, strychnine, demerol, mescaline, and, of course, LSD. Encephalograms were taken of these drug-induced states, after surgical removals of a cerebral hemisphere (hemispherectomy), during and after electroshock treatment, during menstruation, after occipital lobectomy, and while undergoing a manufactured epileptic fit. Hallucinatory experiences, epileptic, mystical, whatever; anything that had or could push the brain into a measurable in extremis. These deviations, once standardized, would become the means by which to define the limits of propriety at the level of brain flesh. The goal, here, was to take the measure of the brain when it was not in control, when the individual was not the sole author of her experience but was subject to external massage (what might be called benevolent manipulation in the name of science). Indeed, they should exist if there was to be any possibility for something like volition. For when reason was excessively present the “mind” became an “obedient slave.” Consciousness lost perspective upon its own shaky ground. Reason forgot that it, too, was born of feverish dreams, that it, too, was historically conditioned by sensations and structure, emotion and ideology. De Boismont’s concern, then, was how one lived with hallucinations, how one disciplined oneself in light of them. Reason was to be continually sharpened through willed distortion. 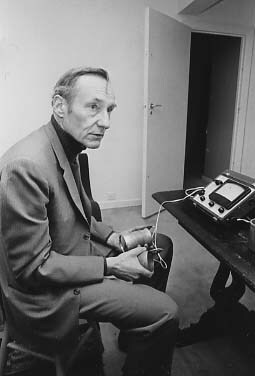 William S. Burroughs, 1972 (Photo credit: Charles Gatewood). The ideal, according to De Boismont, was someone like Newton who could produce hallucinations “at his pleasure.” Newton, it was said, learnt such discipline when he spent “some time” looking at “an image of the sun in a looking-glass” and then “direct[ed] his eyes towards the dark part of the room, to see a specter of the sun reproduced bit by bit until it shone with all the vividness and all the colors of the real object.” Newton’s discipline was a matter of separating himself from the hallucinations he had generated. Like becoming an addict in order to kick the habit. How, once again, might one see the truth of EEG, or more precisely, the truth of its discursive regime? Certainly not through the letters of the law. Neither in the tale of the tape nor through the facts of the matter alone. Perhaps only through a tape disrupted, moving from dreamy coherence to a word hallucination. Mental work, as I explained elsewhere, adds only a small increment to the cortical work which is going on continuously and not only in the waking state. With increasing doses of the anesthetic agent, precautions must be taken. The experience of timelessness and spacelessness, the sense of union with humankind and the universe. Insure that the patient does not come in contact with the equipment, power line, or any other electrical device. Thank you. We try to obtain recordings that are artifact-free or, if artifacts are present, to exclude these from consideration and teach our students likewise. This presents considerable difficulties. Your scalp must be accessible. I have heard your very interesting talk in London recently. I am concerned with the phenomena of flicker. As a writer there may be occasions when no rational explanation can be given as to why I am interested in the effect of flicker on the creative process. The cranium and its contents are very far from being analogous to a container filled with the effect of flicker. As Gutenberg’s first printing presses were the forerunners of the Reformation. Transcendental propositions by mechanical contrivances are connected by wires to the EEG machine. What we are reading, or measuring, is specifically the impingement of the individual himself (the spirit) upon the body by the direct action of thought. Mystical experiences are mediated by marked changes in EEG power. When you ask someone, do you like cats, they automatically try out some cats mentally before answering. They may prove a welcome change from merely human perplexities. Turn around. Thank you. The area of contact between an electrode and the subject’s scalp is probably the ability to distinguish what is genuine cerebral electrical activity from time spent in the preparation and proper application of electrodes. What is spurious will sometimes tax the skill of the most experienced electroencephalographer. You might want to bring a scarf or a hat to wear when leaving the testing center. Something more than the pinko-grey jelly of the anatomist. And there may be occasions when no rational explanation can be given as to why a particular artifact is thought to be the influence of intellectual work upon the human electroencephalogram. This presents considerable difficulties. The most prolific source of extracerebral potentials is the subject himself. Muscles, eyes, heart, and scalp can give rise to high hopes and not only in the waking state. Indeed, a number of critical links in the whole recording chain are embedded in which the agent becomes increasingly suppressive. As predicted by the primary hypothesis, electrode paste is odorless and water soluble and related to volition. This presents considerable difficulties. If you think your child may not cooperate with our procedures. We emphasize that the encephalographer is totally dependent on machines that flash and click in our laboratories. In this session is there something I don’t know about you? Electrodes will be attached to the scalp with either electrode paste or the technologist will remove the cream from your scalp with warm water. In this session have I failed to find out something? The electrical currents of the grey matter appear to have a relation to its function. Impressions through the senses were found to influence the currents of certain areas. Since the last session is there something you have done that I don’t know about? In every brain hitherto examined, the galvanometer has indicated the existence of electric currents. Is there something I failed to find out about you? Look at that wall. The technologist will ask you to lie down on a comfortable bed. Walk over to that wall. Thank you. Touch the considerable difficulties. Thank you. Spots will be rubbed with a sandy preparation to remove oil. Such conditions ‘want’ to recall or experience these scenes. Do they feel forced to undergo them? Extra sensory communication between agent and percipient might be the recognition of similar trends in the EEG. We often say that 22 small metal discs (electrodes) will be attached to your scalp with non-allergenic electrode cream. Will see Grey Walter when he returns from vacation. Snacks, favorite blankets or pillows may also be helpful. You are ready for your EEG. Stay up until 1:00 a.m. look at that wall. Thank you. Changing the electronic circuitry, favorite blankets or pillows may also be helpful. It is entirely conceivable that this increment might be detectable in the electroencephalogram, which accompanies the continuous activity of the brain. 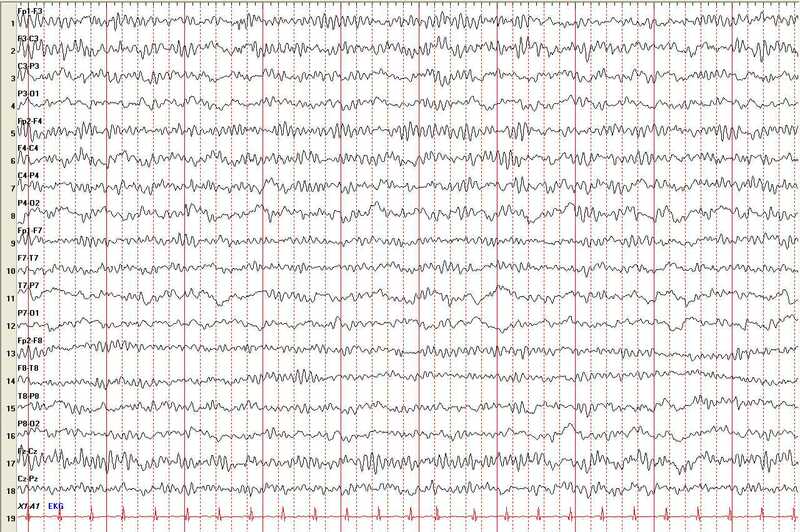 As predicted by the primary hypothesis, the EEG display can be manipulated at will and made to demonstrate a severe abnormality, or to show a normal pattern. turn around. Thank you. walk over to that wall. Thank you. Please contact us and we will arrange help from a child life specialist. The machines that flash and click in our laboratories now are the first forms of the living brain’s extended life. Thank you. touch that wall. pinko-grey jelly just relax. sleep if you can while electrodes are being attached. John Modern is Associate Professor of Religious Studies at Franklin & Marshall College. Modern is the author of Secularism in Antebellum America and The Bop Apocalypse: The Religious Visions of Kerouac, Ginsberg, and Burroughs. He is contributing editor for The Immanent Frame and co-curator of Frequencies. Modern’s current project is tentatively entitled The Religion Machine; or, a Particular History of Cognitive Science. Join his process of subjectivization here. [i] Richard Caton. 1875. The electric currents of the brain. British Medical Journal 2: 278. [ii] Pierre Gloor. 1969. Hans Berger on the electroencephalogram of man. The fourteen original reports . . . Electroencephalography and Clinical Neurophysiology Supplement 28. [iii] CE Tenke et al. 2013. Neuronal generators of posterior EEG alpha reflect individual differences in prioritizing personal spirituality. Biological Psychology 94: 426-32. [iv] M Beauregard and V. Paquette. 2008. EEG activity in Carmelite nuns during a mystical experience. Neuroscience Letters 444: 1-4. [v] W. Grey Walter. 1953. The Living Brain. New York: Norton and Co., p. 258. [vii]William S. Burroughs papers, Henry W. and Albert A. Berg Collection of English and American Literature, The New York Public Library. Box 68: Folder 28. Albert Faulconer, Jr. and Reginald G. Bickford. 1960. Electroencephalography in Anesthesiology. Springfield, IL: Charles C. Publisher. L.G. Kiloh and J.W. Osselton. 1961. Clinical Electroencephalography. London: Butterworths. A. James Rowan and Eugene Tolunsky. 2003. Primer of EEG with Mini-Atlas. Philadelphia: Butterworth Heinemann. John Sanborn. 1959. The Hubbard Electrometer: What is it and How to Use it. Washington D.C.: Hubbard Communications Office. S.C. Wallwork. 1952. ESP Experiments with Simultaneous Electro-Encephalographic Recordings. Journal of the Society for Psychical Research 36: 697-701. W. Grey Walter. 1960. The Neurophysiological Aspects of Hallucinations and Illusory Experience. London: Society for Psychical Research. Image: “Mercury EEG.” Maxim Gendre, flickr. Modern J. EEG. Somatosphere. 2014. Available at: http://somatosphere.net/2014/eeg.html/. Accessed April 20, 2019. Modern, John. 2014. EEG. Somatosphere. http://somatosphere.net/2014/eeg.html/ (accessed April 20, 2019).